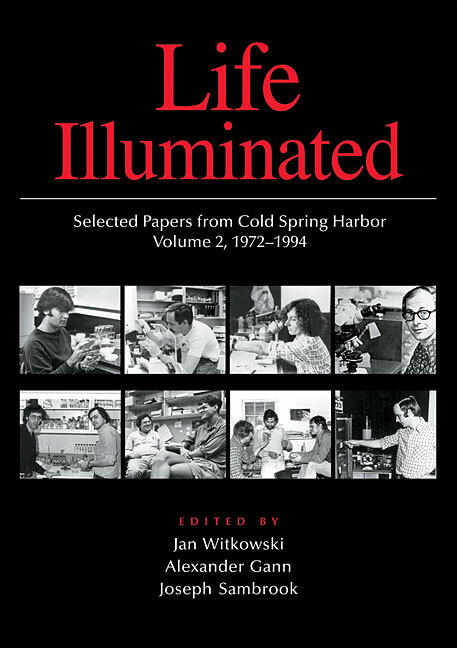 This book is the second volume of an intellectual history of the science done at CSHL (the first volume, Illuminating Life, showed that genetics became the dominant theme of research at CSH by as early as 1904). The appointment of James Watson as Director of the Laboratory in 1968 set off the explosive research development at CSH, as he recruited widely and wisely teams of investigators with diverse scientific interests. From this collection of papers, presented in full on the accompanying CD, several themes emerge: the characterization and exploitation of mobile genetic elements; the mechanics of DNA replication and regulation of the cell cycle; the behavior and internal architecture of cells; how viruses induce tumors; the discovery of cancer genes; the characteristics of neurons; and the invention of techniques that make possible further progress. Each theme is introduced in the context of the science of the time, and each paper has a commentary by, in most cases, one of its authors. Life Illuminated is a story of scientific innovation and achievement, told in the words of the investigators themselves. Ljungquist E. and Bukhari A.I. 1977. State of prophage Mu DNA upon induction. Proc. Natl. Acad. Sci. 74: 3143-3147. Taylor A.L. and Szybalski W. 1984. In memoriam: Ahmad I. Bukhari, 1943-1983. Gene 27: iii-iv. Strathern J.N, Klar A.J.S., Hicks J.B., Abraham J.A., Ivy J.M., Nasmyth K.A., and McGill C. 1982. Homothallic switching of yeast mating type cassettes is initiated by a double-stranded cut in the MAT locus. Cell 31: 183-192. Sundaresan V., Springer P., Volpe T., Haward S., Jones J.D.G., Dean C., Ma H., and Martienssen R. 1995. Patterns of gene action in plant development revealed by enhancer trap and gene trap transposable elements. Genes Dev. 9: 1797-1810. Draetta G., Luca F.,Westendorf J., Brizuela L., Ruderman J., and Beach D. 1989. cdc2 protein kinase is complexed with both cyclin A and B: Evidence for proteolytic inactivation of MPF. Cell 56: 829-838. Watson J.D. 1972. Origin of concatemeric T7 DNA. Nat. New Biol. 239: 197-201. Prelich G., Kostura M., Marshak D.R., Mathews M.B., and Stillman B. 1987. The cell cycle regulated proliferating cell nuclear antigen is required for SV40 DNA replication in vitro. Nature 326: 471-475. Bell S.P. and Stillman B. 1992. ATP-dependent recognition of eukaryotic origins of DNA replication by a multiprotein complex. Nature 357: 128-134. Klimašauskas S., Kumar S., Roberts R.J., and Cheng X. 1994. HhaI methyltransferase flips its target base out of the DNA helix. Cell 76: 357-369. Lazarides E. and Weber K. 1974. Actin antibody: The specific visualization of actin filaments in non-muscle cells. Proc. Natl. Acad. Sci. 71: 2268-2272. Albrecht-Buehler G. 1977. Daughter 3T3 cells. Are they mirror images of each other? J. Cell Biol. 72: 595-603. Bar-Sagi D. and Feramisco J.R. 1985. Microinjection of the ras oncogene protein into PC12 cells induces morphological differentiation. Cell 42: 841-848. Harley C.B., Futcher A.B., and Greider C.W. 1990. Telomeres shorten during ageing of human fibroblasts. Nature 345: 458-460. Spector D.L. 1990. Higher order nuclear organization: Three-dimensional distribution of small nuclear ribonucleoprotein particles. Proc. Natl. Acad. Sci. 87: 147-151. Sambrook J., Sharp P.A., and Keller W. 1972. Transcription of simian virus 40. I. Separation of the strands of SV40 DNA and hybridization of the separated strands to RNA extracted from lytically infected and transformed cells. J. Mol. Biol. 70: 57-71. Grodzicker T., Williams J., Sharp P., and Sambrook J. 1974. Physical mapping of temperature-sensitive mutations of adenoviruses. Cold Spring Harbor Symp. Quant. Biol. 39(Pt 1): 439-446. Chow L.T., Gelinas R.E., Broker T.R., and Roberts R.J. 1977. An amazing sequence arrangement at the 5 ends of adenovirus 2 messenger RNA. Cell 12: 1-8. Botchan M., Topp W., and Sambrook J. 1976. The arrangement of simian virus 40 sequences in the DNA of transformed cells. Cell 9: 269-287. Tjian R. 1978. The binding site on SV40 DNA for a T antigen-related protein. Cell 13: 165-179. Gluzman Y. 1981. SV40-transformed simian cells support the replication of early SV40 mutants. Cell 23: 175-182. Thummel C., Tjian R., and Grodzicker T. 1981. Expression of SV40 T antigen under control of adenovirus promoters. Cell 23: 825-836. Herr W. and Clarke J. 1986. The SV40 enhancer is composed of multiple functional elements that can compensate for one another. Cell 45: 461-470. Zipser B. and McKay R. 1981. Monoclonal antibodies distinguish identifiable neurons in the leech. Nature 289: 549-554. Hockfield S. and McKay R.D.G. 1985. Identification of major cell classes in the developing mammalian nervous system. J. Neurosci. 5: 3310-3328. Yin J.C.P.,Wallach J.S., Del Vecchio M.,Wilder E.L., Zhou H., Quinn W.G., and Tully T. 1994. Induction of a dominant negative CREB transgene specifically blocks longterm memory in Drosophila. Cell 79: 49-58. Goldfarb M., Shimizu K., Perucho M., and Wigler M. 1982. Isolation and preliminary characterization of a human transforming gene from T24 bladder carcinoma cells. Nature 296: 404-409. Ruley H.E. 1983. Adenovirus early region 1A enables viral and cellular transforming genes to transform primary cells in culture. Nature 304: 602-606. Kataoka T., Powers S., Cameron S., Fasano O., Goldfarb M., Broach J., and Wigler M. 1985. Functional homology of mammalian and yeast RAS genes. Cell 40: 19-26. Hanahan D. 1985. Heritable formation of pancreatic β-cell tumours in transgenic mice expressing recombinant insulin/simian virus 40 oncogenes. Nature 315: 115-122. Franza B.R. Jr., Rauscher F.J. 3rd, Josephs S.F., and Curran T. 1988. The Fos complex and Fos-related antigens recognize sequence elements that contain AP-1 binding sites. Science 239: 1150-1153. Whyte P., Buchkovich K.J., Horowitz J.M, Friend S.H., Raybuck M., Weinberg R.A., and Harlow E. 1988. Association between an oncogene and an anti-oncogene: the adenovirus E1A proteins bind to the retinoblastoma gene product. Nature 334: 124-129. Roberts R.J. 1978. Restriction and modification enzymes and their recognition sequences. Gene 4: 183-194. Garrels J.I. 1989. The QUEST system for quantitative analysis of two-dimensional gels. J. Biol. Chem 264: 5269-5282. Sharp P.A., Sugden B., and Sambrook J. 1973. Detection of two restriction endonuclease activities in Haemophilus parainfluenzae using analytical agarose-ethidium bromide electrophoresis. Biochemistry 12: 3055-3063. Maniatis T., Kee S.G., Efstratiadis A., and Kafatos F.C. 1976. Amplification and characterization of a β-globin gene synthesized in vitro. Cell 8: 163-182. Perhaps most importantly, this is a volume about life at Cold Spring Harbor. Very few pages pass without a mention of some word or deed by James Watson and the presence of Barbara McClintock is felt throughout the book. There are fascinating descriptions of Watson making his nightly rounds of the research laboratories, and of him wryly reminding a postdoctoral researcher caught building a model of DNA: [t]hat's been done. Tim Tully tells an interesting tale of Watsons willingness to support a long and often frustrating assault on the biology of memory.